Uuurrrgh.. What can I say? My emotions were rampant. I came across of many chagrins that causes me to desolate. Part-time career wise; you are not always at the top. You are not going to stay as the crème of the crop forever. Sometimes people adore you but this field has a dateline. People are always being replaced with the green ones. Fresher look. Edgier style. YOUNGER. There is still room to grow & flourish but the sooner you learn to accept the truth, the sooner you be on one page with fatalism. Parenting wise; last Saturday we went to Giant Sec. 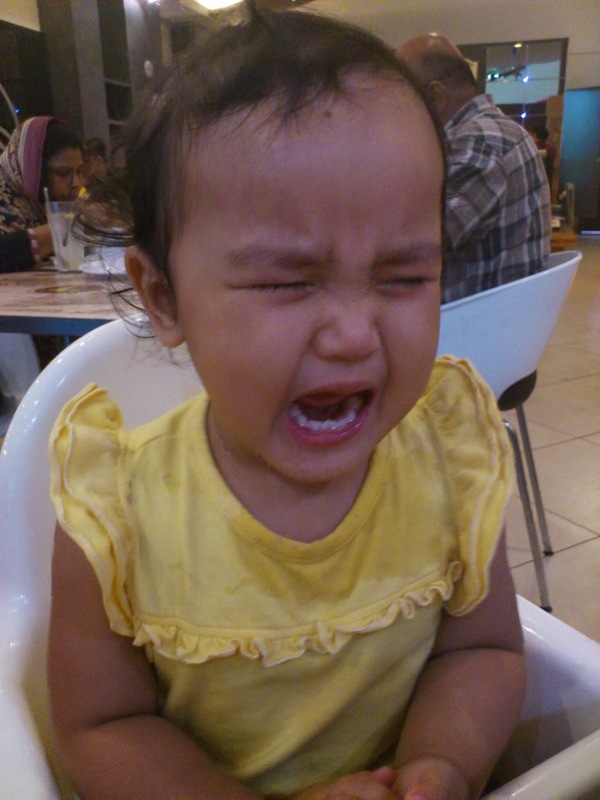 13, Shah Alam for lunch and as usual Piya would implore to play at the indoor playground. So yeah, I asked Ayah to accompany her while I went into some shops. As I arrived at the playground, I scouted for Piya and she was crawling to cross a bridge. I stood there observing her and suddenly something was amiss. A kid who was about her size was playing rather violent with the rest. He reached the bridge from the opposite side but refused to wait for Piya to complete her trail. He stood midway in front of Piya blocking her way. Then he kicked her in the face. Piya screamed but that didn't stop the boy. In a reverse mode, Piya was crying hysterically while the boy continue to kick Piya until she if off the bridge. Normally I let Piya handle her own fights and refuse to interfere. But this was too much. I stood in front of them and yelled "Hoi! Ape nih? Nape main macam tuh?!" Ayah gave me that morbid look and immediately took Piya away. I was extremely filled with rage and refused to let this go away. I trailed the boy's movement and noticed the mother. He had a little sister who was playing by the slides and she too was roughed by the boy. I posted this story in FB and I don't have any intention to criticize or judge parents with 2,3 kids but my sole intention was PLEASE KEEP AN EYE ON YOUR KID (S) AT ALL TIMES. It hurts to see your kid being a victim but it is even worse if your kid causes pain to others. That shows bad parenting. Thank you for reading people.